As a freelancer, I do a wide variety of odd jobs. Mostly writing or editing and primarily food or television. However, for the last year I've worked on one the most unique projects of my freelancing life. Who among you out there is familiar with manga in its various forms? One, two, three -- okay, not too many. 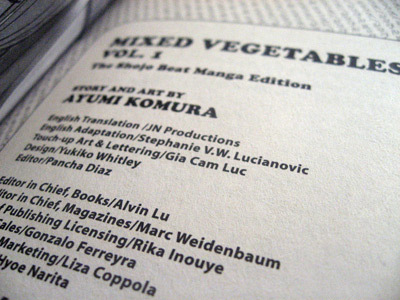 So, manga is basically Japanese graphic novels (we don't call them comic books any more, do we?) and there are different genres within the format that appeal to various age groups and interests. The series I work on is classified as "shojo" and is aimed mainly at girls from ages 10-18. The thing is, I don't speak, write, or read Japanese. But that doesn't matter because what I do is take the literal English translation of the text and rewrite it. I smooth, tighten, and make it conversational. Why me? I'm not totally sure, but my editor at Viz Media contacted me after reading my stuff at Television Without Pity and the Grub Report. 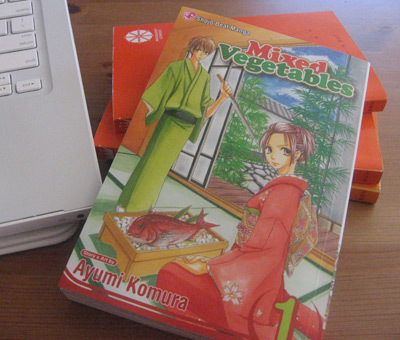 Also, the manga I work on, Mixed Vegetables by Ayumi Komura of Hybrid Berry fame, is about two Japanese teenagers falling in love in culinary school, so there's my food angle! See, Hana Ashitaba wants to be a sushi chef, but her father is a patissière who has always assumed she would to take over his shop. Conversely, Hayato Hyuga is the son of a sushi chef but dreams of becoming a pastry chef and the same parental expectations apply. The six volume series deals with their relationship and its typical pitfalls along with their progress through culinary school and how they handle disappointing their fathers. It's classic Romeo and Juliet stuff. Especially if Volume 6 has Hana stabbing herself with her Yanagiba knife after finding that Hayato OD'd on those decorative little silver balls that are banned in California. Aside from the experience of working on unique project that's so different from anything else I do, what I most love about re-writing manga are the special effects noises. You know about the FX noises in comics, right? What I remember from Spiderman Comics are things like "POW!" "BLAM!" and the occasional "KA-BLOOM!!" I don't recall too many FX in Archie Comics, aside from the recurring black scribble over Veronica's head to signify a bad mood, and the stars that show up when Jughead skins his knee on the beach while diving to keep his bizarre crown-hat on his head. My editor gave me a list of typical special effects noises so I could have an idea of how they work. For instance, a train on a track might sound like, "ka-chk ka-chk ka-chk" and fire could be either "foosh" or "krkkl krikkle," depending on the violence of the flames, I believe. However, she also encouraged me to come up with my own noises and have fun with them. I definitely loved the original Japanese "doka ka ka ka ka" for fast chopping on a wooden board and left it alone, but I'm pretty proud of coming up with "ga-shwing" for pulling a knife out, and "ZHOOP" for a Japanese door sliding back. In Volume 1, I started compiling a glossary for various Japanese words (usually food terms) in order to keep them pure without over defining them in the actual script. Like, "udon," "suppon," "sansho," "arai," and "sogigiri." I also decided to define words that might be more familiar to American readers like "julienne," "shiso," and "char" just to be on the safe side. (Recapping Top Chef taught me that not everyone knows the culinary terms I might take for granted.) My editor liked this so much, she told me to keep it up across all the volumes. I turned in my script for Volume 3 a few weeks ago and will be starting work on Volume 4 mid-August, but today I got a FedEx'd advanced copy of the finished first volume, which will be at a bookstore near you on September 2nd. On the other hand, my editor had no complaints, so maybe I'll just go do yoga instead. Or not. A quick scan can't hurt, right?